The Belfast Telegraph described him “A born comic and a keen observer of the idiosyncratic; Brilliantly original. Magnificent”. wordsmith has graced the world folk scene for 25 years yet still sees himself as an apprentice songwriter. 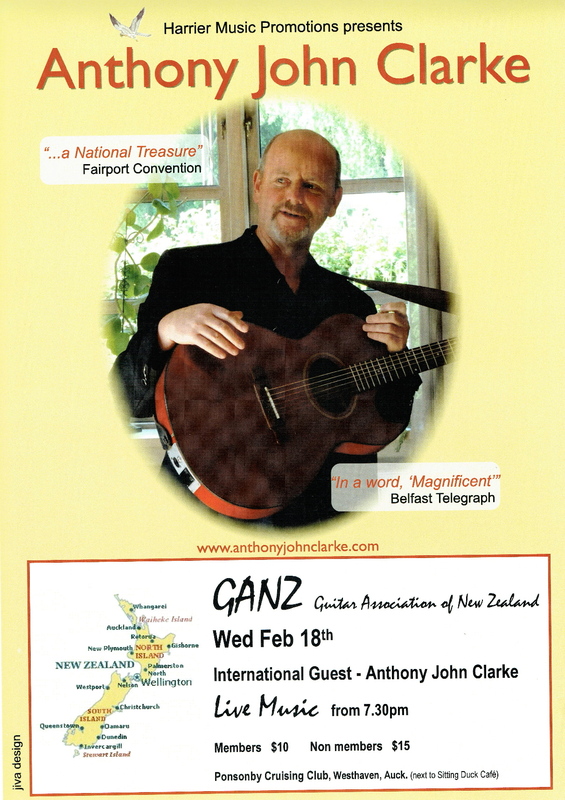 Clarke last played New Zealand two years ago, where he charmed and mesmerised audiences in clubs, cafés and festivals with his songs, antics, anecdotes and wit. His songs range from poignant laments that touch the heart and leave a lump in the throat to songs dealing with the lighter side of life, full of mischief and mirth. His songs often bring on laughter and knowing smiles, confirming his eye on our behaviour is never too far off the mark. 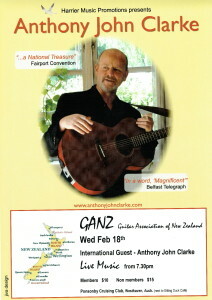 Anthony John Clarke is highly entertaining and enormously engaging. His concerts leave audiences charmed, beguiled and calling for more. Audiences leave his show with laughter in their hearts and smiles that can’t be dampened. They have a lightness of being. An acknowledgement that they’ve seen a truly gifted artist.